Since I was a kid, I used to marvel at everything around me, older than me; cars, motorcycles, buildings, weighing scales, fans ... I would go into my fathers Chevrolet and would be enchanted. I used to gaze at pictures of his older cars all the time. I used to collect 'cards' and knew then every model of every car maker in the world! Much later, during the time I was studying architecture in Rome, I bought my first car in Greece; a Mercedes 170S, wow! I went on to buy more cars. 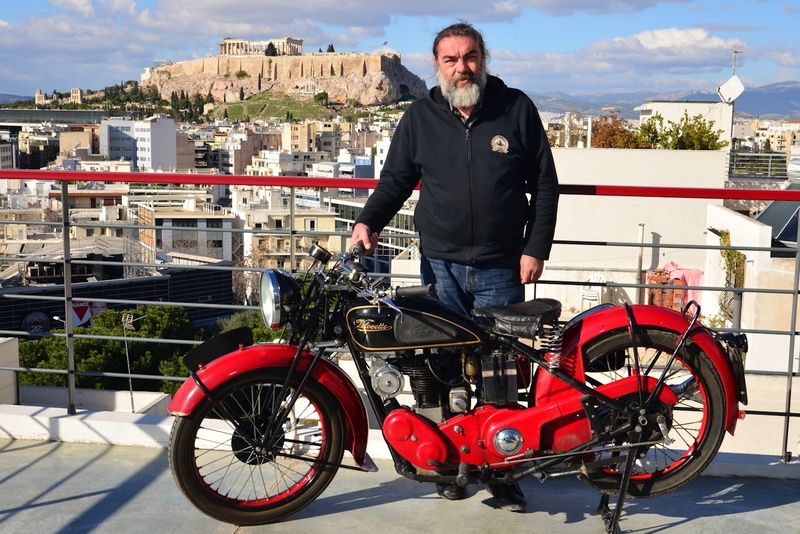 And it was about then that I used to hang with my carpenter friend Yiannis, marveling at him on his shiny Horex. – Do you fancy take her for a ride? – Yes! I rode that bike and instantly fell in love. That bike stole my heart. A Horex Regina 400. In the corner garage I was offered a '57 Matchless G 80 S. I bought that as well. I started looking around. Anything and everything that clicked to me, I bought. At the same time, I started reading and learning all I could. From my room I used to watch the 'coal man' selling butane gas canisters in his BMW R12 based tricycle. Two years later and after constantly bragging, I bought it − I had fallen in love, again. My bike collection began to grow and with this, my idea of a suitable place to house and display them began to take shape. I tried to get state support, but this led to nothing. In the end, I decided to house them where I live, build a home for me and a home for them. Every single motorcycle presented here has a special place in my heart. Machines of drudgery, machines that fought a war, machines which served our country, machines full of innovations. Machines which were raced, machines which took their riders around the world. With time, I was becoming more and more excited by ever older motorcycles. In my pursue I was also collecting and studying every piece of useful information I could get my hands on. I got deeply involved with our Club, (Hellenic Classic Motorcycle Club), where I met with, and made many new friends, all similar minded folks. Gradually the restoring 'standards' of my acquisitions were getting higher and higher. I was researching the field, studying and learning all the time. I still continue to learn something new every single day. Books. These offer considerable added value for my Collection. For every machine there are service and parts manuals, and a lot more. The condition of my bikes is in relation to their age and the use they had when in service. All bikes however are roadworthy and indeed, battle ready. I ride most of them given the slightest opportunity! In this web site I would like to present to you my 'labor of love' from so many years ago. I have tried to describe, as best I can, my life since around 1985. In doing so I hope I am successful at conveying to you some of my 'passion'.